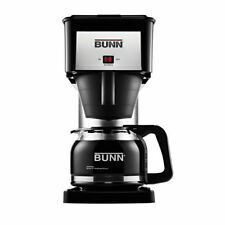 Showing results for "bunn coffee maker"
Brazil red french press coffee maker. Made from heat resistant borosilicate glass, stainless steel handle, dishwasher safe. , Glass , Handwash recommended. The Brazil French Press Coffee Maker has an attractive design. The domed lid is made of a smooth polypropylene and has an aroma seal to keep your coffee warm for longer. It also features a heat resistant, borosilicate beaker and a polypropylene handle and base. Glass. 1 litre capacity. 8 cup capacity. Removable plunger coffee filter. Safety lid to help prevent spills. Dishwasher safe. Size H23, diameter 15cm. Brazil black french press coffee maker. Made from heat resistant borosilicate glass, stainless steel handle, dishwasher safe. , Glass , Handwash recommended. Ideal for people who need a cup of coffee for the morning perk this travel press features a comfortable, ergonomic silicone band Size: Large. Colour: Red. Gender: Unisex. Age Group: Adult. The Magimix Nespresso coffee machine combines sophisticated technology together with ease of use for a guarantee perfect espresso every time. The Nespresso Pixie has an automatic and programmable water quantity control and a Sliding cup support adjustable for small or large cups. Covered by a 3 year Nespresso Home Collection guarantee. Innovative nespresso capsules contain the perfect amount of freshly roasted and ground coffee. Switches off automatically after 9 minutes after lase use. 19 bar pressure/ thermoblock instant water heating system. Power output 1260 watts. Water capacity 0.7 litre. Water gauge. Keep warm function. Auto shut-off. Size H23.5, W32.6, D11.1cm. Manufacturers 3 year guarantee. Ideal for people who need a cup of coffee for the morning perk this travel press features a comfortable, ergonomic silicone band Size: Large. Colour: White. Gender: Unisex. Age Group: Adult. The POUR OVER promises excellent, rich taste and robust aroma. Simply fill the cone-shaped filter with freshly ground coffee and pour a small amount of heated water over them until soaked. Slowly pour the remaining hot water into the filter. Coffee will drip into the mouth-blown, borosilicate glass carafe and in 3-4 minutes, will be ready to serve. Remove the filter from the carafe before serving and enjoy; Glass. 1 litre capacity. 8 cup capacity. Dishwasher safe. Size H22, diameter 13.8cm. 10 cup, 1.25L capacity drip coffee maker with glass carafe. Easy to see water level indicator so you know when to refill the tank and simply refill water and coffee without moving the machine. The Eco function automatically shutss off 40 minutes after the coffee brews. 10 cups. Njug warmer base to keep your coffee up to 40 minutes hot. Automatic stand-by function after 40 minutes. 1000 watts. Water capacity 1.25 litres. Water level gauge. Auto shut-off. Size H34.6, W17, D27.4cm. 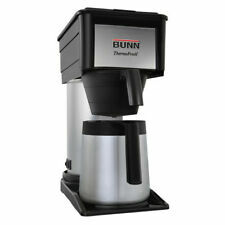 eBay Repair Your Bunn Coffee Maker, Water Not Heating?Link Kit ***2 SETS*** READ ADD! Ideal for people who need a cup of coffee for the morning perk this travel press features a comfortable, ergonomic silicone band Size: Large. Colour: Black. Gender: Unisex. Age Group: Adult. eBay Repair Your Bunn Coffee Maker, Water Not Heating?Link Kit ***2 SETS** READ ADD! Theres nothing quite like the aroma of full-flavoured coffee. Enjoy it every day with this Cookworks filter coffee maker. It has an anti-drip device to keep the coffee in the cup, so you dont miss a drop; If youre not quite ready for your coffee, hit the keep warm; button. Set the programmable timer, so you can wake up to a hot pot of coffee in the morning. Youll be full of beans for the day - brew-tiful; Power output 870 watts. Water capacity 1.25 litres. Water gauge. Comes with a permanent filter providing a cheaper, fuss-free option. Thermostatic hotplate. Keep warm function. Timer. Auto shut-off. Size H26.4, W17, D30cm. The Bodum Caffettiera French Press Coffee Maker is a simple way of making coffee that will extract the most essential oils of freshly ground coffee, leaving least sediment in your cup. This coffee maker is made of chrome plated steel and the plastic handle and lid protect you from the heat whilst the glass liner is made from heat resistant borosilicate glass. Glass. 1 litre capacity. 8 cup capacity. Removable plunger coffee filter. Safety lid to help prevent spills. Dishwasher safe. Size H24.5, diameter 17cm. The Bodum Caffettiera French Press Coffee Maker is a simple way of making coffee that will extract the most essential oils of freshly ground coffee, leaving least sediment in your cup. This coffee maker is made of chrome plated steel and the plastic handle and lid protect you from the heat whilst the glass liner is made from heat resistant borosilicate glass. Glass. 0.35 litre capacity. 3 cup capacity. Removable plunger coffee filter. Safety lid to help prevent spills. Dishwasher safe. Size H19, diameter 13.5cm. 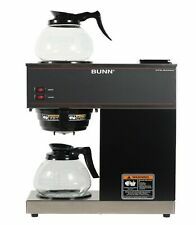 eBay Vintage Bunn Pour-Omatic 6-Cup Coffee Maker Made in the USA! The Bodum programmable 12 cup coffee maker is ideal for even the most particular coffee enthusiast. It features a rain shower head that uniformly distributes the water over your ground coffee for consistent extraction and a balanced full flavour. The shower head spreads even water over the ground beans. A clear lid, allows you to see the brewing process from above. Programmable up to 24 hours in advance for convenience. Power output 900 watts. Water capacity 1.5 litres. Water gauge. Comes with a permanent filter providing a cheaper, fuss-free option. Thermostatic hotplate. Keep warm function. Timer. 24 hour programmable timer. Auto shut-off. Size H40.5, W19.4, D29.3cm. Manufacturers 2 year guarantee.